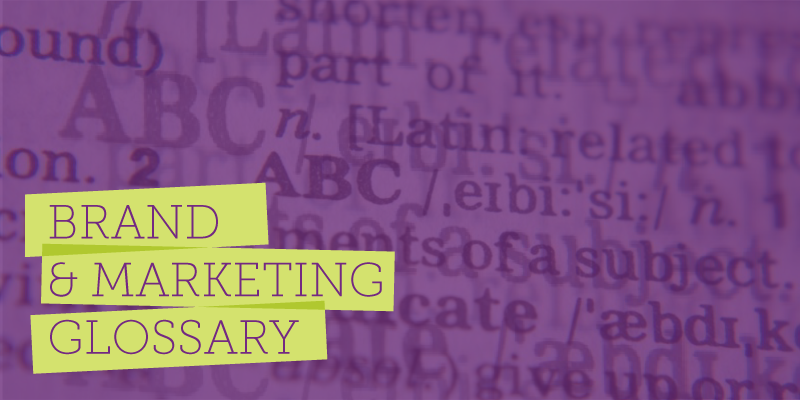 In the world of marketing (and any other industry, for that matter), there are many terms and definitions taught first in college, and even more so once you're thrown into the field. While terms like branding, marketing, personas, demographics, etc. are part of our everyday vocabulary (Monday through Friday, anyway), they may not be part of folks' vernacular outside of the marketing industry. Things get even more confusing when the industry acronyms get thrown around—KPI, ROI, USP... say what?! That being said, we're here to break some of these terms down for you so you can have a clear understanding of what the heck we're talking about in our blog posts, social media, and the like. ; ) Here we go! Contrary to popular belief, brand is not how you and your employees perceive your company—it's how the public, most specifically your target audience, perceives your company. While brand is in the eyes of the beholder, per se, there are things as brand marketers we can do to help shape your brand and its reputation in the public eye. The act of "branding" contributes to this effort. A brand strategy is a plan behind "branding" that (ideally) should be formulated, presented and executed after a brand marketing team takes a deep dive into all the nuances of your company. This strategy should be well-thought-out and offer a long-term plan to elevate your brand and set you up for success for years to come. Simply put, a persona is a written representation of your brand's target audiences including demographics, psychographics and interests in the form of a fictional buyer. These are incredibly in-depth and cover the most important details of your primary, secondary and tertiary audiences—and possibly even beyond. These nuances may include household income, height, weight, age, race, sexuality, hometown, job, education level, political preferences, transportation type, spending habits, family structure, hobbies, etc. An audience profile is similar to a persona, but doesn't go as in-depth. Rather than recreating an actual individual from your TA like a persona would do, an audience profile provides more of a high-level overview with insight into multiple target audiences that likely have one or more psychographic and demographic characteristics in common—including age, race, religion, income, preferences, sexuality, profession, family size, education level, marital status, and more. A brand's unique selling proposition (USP) is just that—the specific, unique characteristic that sets your brand's product or service apart from your competition. This is especially important to communicate with your TA in your messaging and positioning if your company is in a saturated market, such as restaurants or retail. Your company's brand standards are the set of rules and guidelines your internal stakeholders should abide by in order to portray your brand consistently in your market. We define and compile your specific standards in a Brand Manual that includes logo usage specifications, color palettes, content types (copywriting, photography, videography, graphics, etc.) and usage, fonts, message architecture, and more. As your Brand Marketing Ally, we encourage you to have and use your Brand Manual as the comprehensive guide on how to maintain your brand standards at all consumer touchpoints. Demographics refer to statistical data relating to the population and particular groups within it. These are especially important to know about your main target audiences, as they signal which marketing strategies, tactics and communication channels will reach these folks best. In marketing terms, a campaign is a planned mix of marketing tactics to promote an individual product, service, or specific promotion. A campaign may include a mix of several different media including print, online/digital, social, outdoor, guerilla, grassroots, and more. Better known as “SEO,” this is a marketing discipline focused on growing visibility in organic (non-paid) search engine results. SEO encompasses both the technical and creative elements required to improve rankings, drive traffic and increase awareness within search engines. There are many aspects to SEO, from the words on your page to the way other sites link to you on the web. This is an ever-changing colossal beast that’s best left to the professionals, to be frank (like TIS). Otherwise known as SEM, this is an umbrella term for a form of digital marketing that seeks to promote websites by increasing their visibility in search engine result pages (SERPs). SEM methods include search engine optimization (SEO), pay-per-click (PPC), contextual advertising, digital asset optimization, and paid inclusion. Oof—lots of acronyms! Again, something to be left to the professionals. CRM is a term that refers to practices, strategies and technologies that companies use to manage and analyze customer interactions and data throughout the customer lifecycle, with the goal of improving customer-service relationships and assisting in customer retention and driving sales growth. There are hundreds of CRM software platforms but the most commonly known platform is Salesforce. An email sender reputation is a score that an Internet Service Provider (ISP) assigns to an organization that sends email—and believe us when we say it’s a crucial component of your email deliverability. The higher the score (0-100), the more likely an ISP will deliver emails to the inboxes of recipients on their network. A sender could have varying reputation scores for different ISPs. If a sender has multiple domain names and sends email from different IP addresses, each one will have its own sender reputation. Key Performance Indicators, aka KPIs, are values used by brands to measure and track the performance of marketing campaigns. KPIs will vary depending on your industry and goals. For example, eCommerce organizations may look at “conversions” as a key performance indicator. Companies spending money on PPC to build a lead list may look at “cost per acquisition” as a key performance indicator. KPIs should be firmly established before launching any marketing campaign. Sometimes referred to as “meta tags,” Metadata is the data contained in a web page’s HTML attributes that are used by search engines to identify the page’s topic. Metadata includes the page’s Title Tag, Description Tag and Keywords which help provide concise summaries of a web page. The title tag and meta description are displayed to Google users in the search engine results as clickable headlines for a given result. Metadata is important for usability, SEO and social sharing. This concept is pretty straight-forward—website traffic from search engine results that is earned rather than paid, including traffic where the user searched a branded keyword phrase for a business and clicked on the organic listing instead of accessing the website by typing in the domain. Organic traffic growth is a strong indicator of a healthy SEO program. SERPs up, bro! ; ) These guys are the pages displayed in Google, Bing or other search engines in response to a user’s query. In Google, which dominates 97% of all search, the SERP results will likely contain paid text advertisements, shopping ads, image results, and knowledge graph data which appear as panels or boxes on the right side. Graphic design is a profession that uses problem-solving techniques to communicate a message visually to a targeted audience with the goal of achieving a desired effect. Graphic designers have to be mindful of a brand’s standards to ensure consistency, while also creating effective, engaging, readable, and motivating messages in a visual manner with combinations of typography, photography, illustration and graphic elements. Creative direction is a difficult term to describe and many people (even in the industry) are unsure what it means, exactly. To define it, first you need to understand that this discipline is responsible to champion the intersection between design, art direction and strategy, as best said by Dan Mall, a creative director in Philadelphia. Where these concepts come together, creative direction is found. Many agencies promote or appoint a graphic designer or an art director to CD, but that isn’t necessarily the best move. Not every great designer or art director has the necessary skills to become a great CD. The best CDs are always aware of two key things: brand integrity (art direction and design) and the client’s bottom line (strategy). If either of these falls short, it’s bad creative direction. Typography is the arrangement of words and numbers on a page in such a manner to increase the copy’s readability and generate an effective hierarchy (importance) and flow. This is both a technical and artistic discipline as it involves rules and mathematical calculations for line height (leading in print) and design savvy to effectively communicate a brand’s personality and obtain the desired call to action. Depending on whether you’re producing a digital or print piece, you will be using different types of color systems. Even within print, there are various types of color, but to keep it simple, we’ll define the two most common. Anything in the print world consists of two types of color: CMYK and Pantone (PMS) and in the digital world: RGB or Hexadecimal (HEX). CMYK – Cyan, Magenta, Yellow, and Black (4-color process) is a method used by printers in which tiny dots of these four ink colors are printed on a press in different combinations where the semi-transparent dots overlap one another to create a spectrum of possible colors. This is one of the most common printing methods used to achieve full-color printing. PMS (Pantone® Matching System) is a patented color system created by Pantone® for the graphics community. Designers and printers use this system to select and reproduce precise shades of color. Each color is numbered in their formula guides for easy reference and reproduction. When a precise color is required, we use a PMS color on a printing press for either a 1- or 2-color run or in addition to a 4-color job as a fifth color on the press. Use of PMS colors can make printing more expensive since you have to pay for the PMS ink, and it has to run on a traditional (offset) press vs. a digital press (which is more expensive unless you’re running very large quantities). Digital printing approximates PMS colors, but true PMS colors are precisely premixed offset inks. Quantity plays a factor here too, so it’s best to rely on your designer or printer to help determine the best way to run your print job. RGB (Red, Green, Blue) is the most common profile for use on any type of screen from computers and televisions to your mobile device. RGB is considered an additive color process that mixes versions of the colors to achieve a variety of color options. When the three colors are fully saturated you see white and when they are completely removed you see black. HEX (Hexadecimal): This six-digit combination of letters and numbers are defined by a blend of red, green and blue (RGB). The HEX color code is used primarily by designers and web developers and is short for the RGB values with additional conversion. There are several free online conversion tools to obtain the value. Die cutting is a process where a die (a thin, razor-sharp blade that is formed into a specific shape or pattern) is used to cut through low-strength materials such as paper, corrugated fiberboard, paperboard, rubber, foil, etc. to create a specific shape. Die-Cutting is an automated operation that allows multiple pieces of the same shape to be cut in an efficient and uniform manner. Many printers have a selection of standard dies that are readily available for common shapes. This term is used to describe the negative space in a layout or composition that helps draw attention to the content that you want people to notice first. It doesn’t have to be white, but rather “negative” space that does not contain copy or graphics. At times it’s necessary or more economical to use Stock photos for campaigns or design projects versus having an image professionally shot. A stock photo is a professionally shot photo that is available for a licensing fee through an online service. Stock images are available in large libraries online that can be searched based on the subject, type, size and style of image desired. Your brand voice is everything. It’s how you speak, write, sound, and communicate who you are at the core of your audience. Like humans, every brand voice is (should be) unique. There are different tonal attributes that every company should follow when writing and speaking in the brand voice—no matter the team member’s position. It’s important to document the ins and outs of your brand voice once it’s established and share with all staff members so you are being consistently represented in the marketplace. A blog is essentially a journal of relevant content to a company’s brand and its industry. “Blogging” is simply the act of maintaining a blog. There’s a whole lot that goes into blogging—including brainstorming, research, content planning, writing, editing, more writing, more editing, asset creation and collection, search engine optimization, publication, promotion, and beyond. When done well, proper and consistent blogging practices will help keep your brand relevant and ranking high in search queries. A hierarchy of communication goals that form a common vocabulary, gain consensus among stakeholders, and direct communication with your target audience. Our favorite Content Strategist Margot Bloomstein helped us shape our process for messaging, stressing that an upfront investment in prioritized messaging streamlines the design and copy processes, saving you time and money. Content marketing is just that—marketing that involves the creation and sharing of relevant and branded content (e.g. blog, videos, photos, copy, social media posts, etc.) to promote a brand’s services or products. All content that is created for your brand should be strategic, well-thought-out, purposeful, and valuable for your audience. Evergreen content is an extra-special type of content piece because it stays relevant forever and ever and ever…. well, maybe not actually forever, but it will pretty much always stay relevant for your audience. When a content piece, such as an article, blog post, or white paper, can be considered evergreen content, that means traffic will continue to grow to this piece over time and keep your business relevant in a particular industry space both in person and online. Inbound marketing hooks a fish on the line before they're even ready to bite, per se. It's a process of attracting your target audience's (TA) attention by creating content before they're even ready to make a deicison—whether it be to purchase, sign up for your newsletter, volunteer, etc. This is one of the most cost-effective ways to expand your TA. This type of marketing includes a lot of traditional marketing tactics to attract potential customers. Think trade shows, seminars, cold calling, etc. Outbound marketing is typically much more costly than inbound marketing and has a much lower ROI. Any type of media directly under a brand's direct control, like their website, newsletter, social media, and blog. Shared media typically lives on social media sites like Facebook, Twitter, Instagram, and YouTube where a brand and its followers interact directly with one another. The "shared" part is due to the nature of social sharing from a brand's page to an individual's personal page. Essentially, earned media refers to publicity gained through promotional efforts other than paid media advertising. An example would be online reviews on Facebook, Yelp or Google, as well as blog mentions. Let's get mathematical! Shared impressions are the number of impressions you've received divided by the estimated number of impressions you were eligible to receive. Eligibility is based on your current ads' targeting settings, approval statuses, bids, and Quality Scores, according to WordStream. Data nerds, represent! This is the practice of measuring, managing and analyzing marketing performance to maximize its effectiveness and optimize ROI. This is what gives us insight into how to be more efficient with marketing time and budgets.